I’ve just had the opportunity to see some of the consequences of the hurricane Patricia that affected Jalisco, Mexico, last weekend. 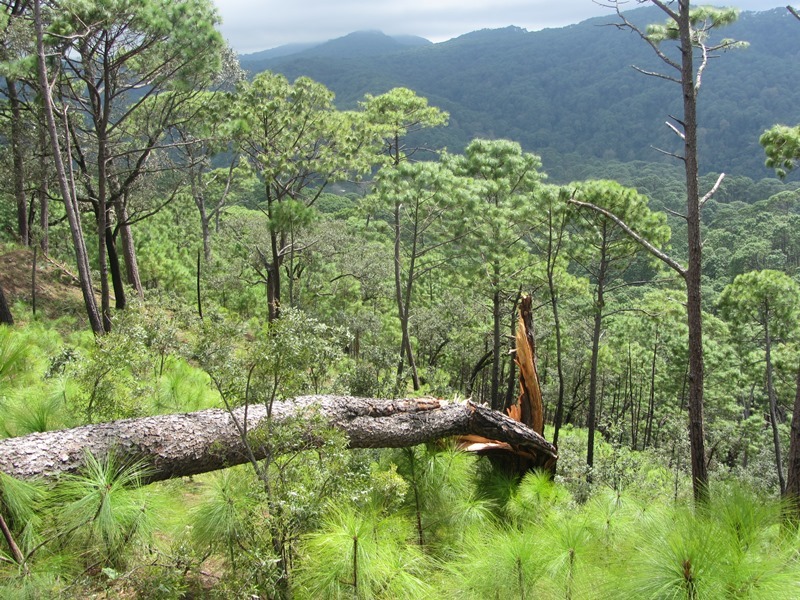 Here is the effects on a Pinus dauglasiana forest in the Sierra de Manantlán biosfere reserve. Some parts of this forest had burned several years ago (< 10 years) mainly as understory fire, and some trees were injured at the base but most survived (as in any typical undertory fires); there were also some crowning in small patches. Fire killed many understory fire-sensitive broadleaved shrubs, and were replaced by a high density of the pine seedlings (Fig. 1); there were also some plants resprouting (e.g., Quercus, Arbutus, etc.). Now, the strong winds of the hurricane is interacting with fire in two ways: (1) the wind have killed some of the fire-injured trees that had survived the fire (Fig. 1); and (2) the wind has greatly increased the fuel in the forest floor, even in the places where trees were not blown down (Fig. 2), which implies an increase in the chance for a surface fire of high intensity during the next dry season. That is, this seems an opportunity to study the interaction between these two disturbances, fire and hurricanes. Fig. 1. Pinus dauglasiana forest after a fire (see the seedling regeneration) followed by an hurricane. Fig. 2. 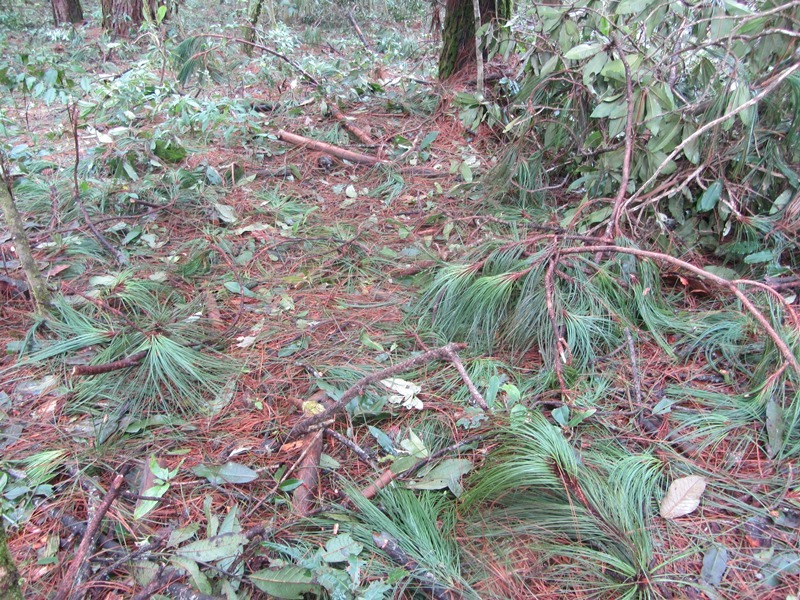 The forest floor of the Pinus dauglasiana forest (unburned) has greatly increased the fuel after the hurricane even in the places where trees were not blown down; the whole forest has a carpet of recently fallen branches and leaves. Top: limit of the fire, with the Montserrat mountains in the background. Middle: resprouting of understory plants; Arbutus unedo in the right. Bottom left: concentration of pine nuts around an ant nest. Bottom right: Genista scorpius resprouting. Photos by J. Garcia-Pausas (top, bottom right), A. Mazcuñan (bottom left), JG Pausas (middle). Given an ignition source and the right environmental conditions, all plants can potentially burn. However, some plants have characteristics that make them burn more easily. The capacity to store volatile organic compounds (VOCs) such as aromatic terpenes, can be considered one of these flammability-enhancing traits (flammable organic compounds, FOCs), as has now been demonstrated for Rosmarinus officinalis : The more terpenes in the leaves, the more quickly they ignite (i.e., less time to ignition) (Figure below). Other species enhance flammability by having a very fine fuel, retaining dead fuel or having a flammable canopy structure [2-5]. 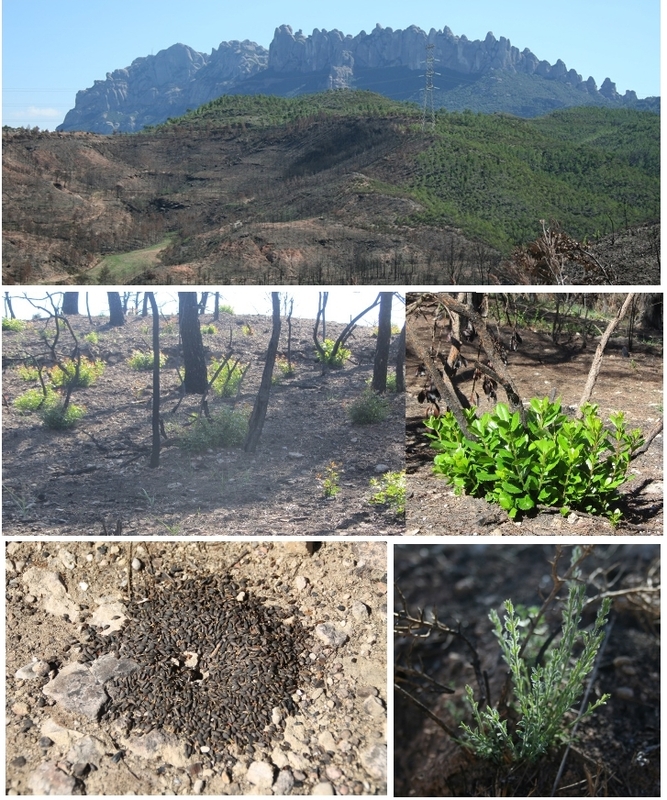 There is growing evidence that flammability-enhancing traits are adaptive in Mediterranean fire-prone ecosystems [2-4]. To what extent the evolutionary pressure exerted by fire could have contributed to the abundance of aromatic plants in many fire-prone ecosystems (mints, rosemary, thyme, eucalypts, etc…) remains unknown. But certainly Mediterranean ecosystems are probably the most aromatic and among the most flammable ecosystems in the world. 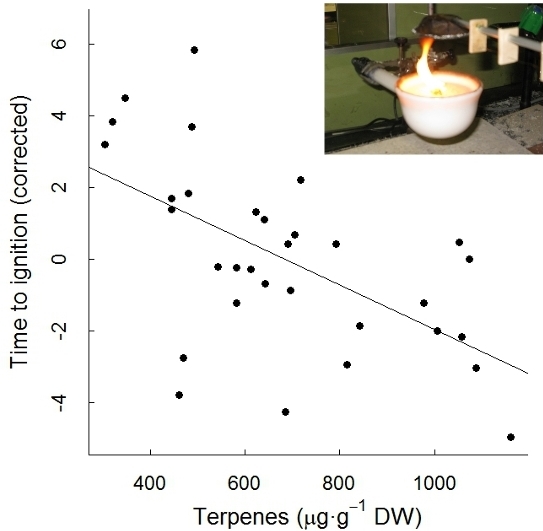 Figure: relation between time to ignition (given a heat source, corrected by the differences in moisture) and the contents of terpenes (here the sum of camphene, para-cymene, borneol, limonene) in leaves of a wild population of rosmary (Rosmarinus officinalis), in Eastern Spain (from ). The top right corner shows the epiraditor, the device for testing for time-to-ignition (see ).